Ramabyte Design > Projects > Game On! A poster created for the campus wide event of “Game On!” held by the RA staff of the Colannades/Cunninghams buildings at Longwood University. The event was held in the giant gym on Longwood’s campus with a multitude of games that were life-size! Featured events included life-size Angry Birds, Monopoly, Chutes & Ladders, bowling, and Candy Land. The campus wide was a great success bringing in close to 400 students! 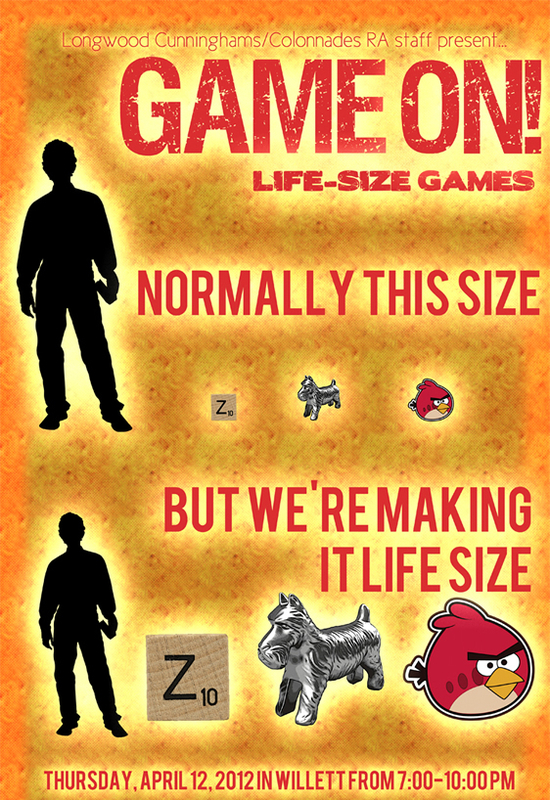 I played around with several different designs for this poster, unhappy with all of them until I came to this theme of actively showing and comparing the size of the games to a person. Upon a recommendation I created the side by side comparison to show the students of Longwood University this event was truly going to be life-size.